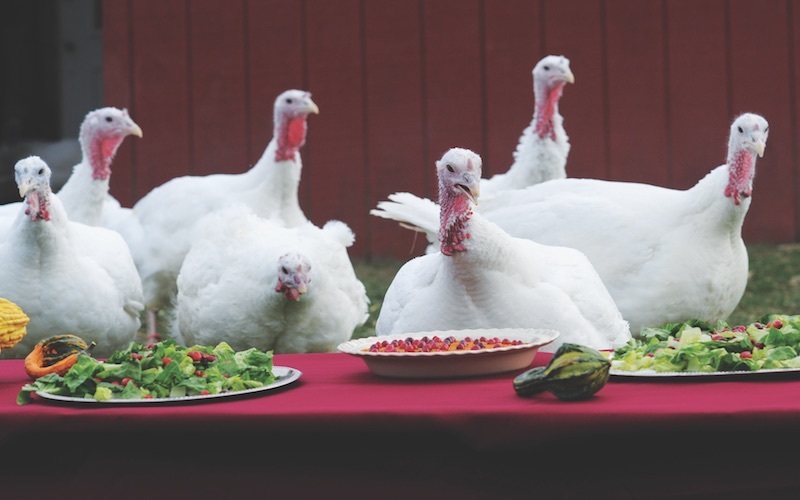 ON A NOVEMBER morning at a sprawling farm about an hour north of downtown L.A., volunteers will be gathering in a kitchen to prepare a special Thanksgiving meal—greens, cranberries, squash, and pumpkin pie—while eight turkeys mill around outside. But Henrietta, Gobbles, Spunky, and the others have nothing to worry about. In fact, they may be the only turkeys that actually look forward to the holiday. Then came the idea to invite people over to his home to feed the turkeys on Thanksgiving. Eventually he relocated to a farm in upstate New York and added two California sanctuaries—one in Orland, the other in Acton—that are home to hundreds of rescued farm animals, from chickens and turkeys to sheep and goats. Baur sees them as ambassadors. He understands that a lot of people don’t want to give up eating turkey but hopes that encountering one might encourage a person to look at their plate differently. “Turkeys are some of the friendliest animals you could ever meet,” he says. “We have turkeys that follow you around like puppy dogs. They’re curious and very companionable. They’re individuals.” They don’t drink too much, bring up politics, or accidentally start spilling family secrets either, which makes them ideal Thanksgiving guests. Drawing hundreds of visitors who pay $50 each, the annual event sells out almost immediately, so two are on the calendar this year: November 4 and 5. (Vegan celebrities Moby, Joan Jett, Alicia Silverstone, and Betty White are supporters.) There’s a vegan lunch, and people get to see the animals up close, but the main course is to watch the turkeys. Staffers lay out a long, low (as in a few inches off the ground) table, covering it with a cloth and plates of food. People gather around and sit on hay bales. One by one, the staffers coax the turkeys to the feast, making kissing and soft clucking sounds. The more aggressive birds run right out, jump on top of the table, and stick their faces into bowls of greens—kind of the way your Uncle Irv does every year. Others approach slowly, eyeing the Insta-snapping onlookers warily and then digging in. Before long, people are out of their seats, petting and playing with the turkeys. The birds, in turn, gurgle back contentedly, as if purring, and flap their wings.